Is Mario Kart 8's Mercedes GLA The Future Of Game Product Placement? By now you've probably seen the delightful Japanese Super Mario Bros. ad for the Mercedes-Benz GLA. (If you haven't, you need to watch it.) But Mario and Mercedes go deeper than just that ad: You'll be able to download a GLA to drive in the all-new Mario Kart 8 game. Eurogamer reports that gamers in Japan this summer will be able to download a digital version of Mercedes' newest small crossover for use in Mario Kart 8. Right now, it's only in Japan, because it's part of the Nintendo-Mercedes tie-in happening in the former company's home country that comes complete with a wonderfully 8-bit website for the GLA. But Nintendo seemed "positive" when Eurogamer asked if it could happen elsewhere. Video game tie-ins with automakers are nothing new. In real life, you have cars like the Call of Duty Jeep Wrangler, and new cars now even make their public debuts in Gran Turismo before they ever come to actual auto shows. The Nissan Leaf made an appearance in SimCity. And obviously, real cars are a big deal in racing games like that and Forza. 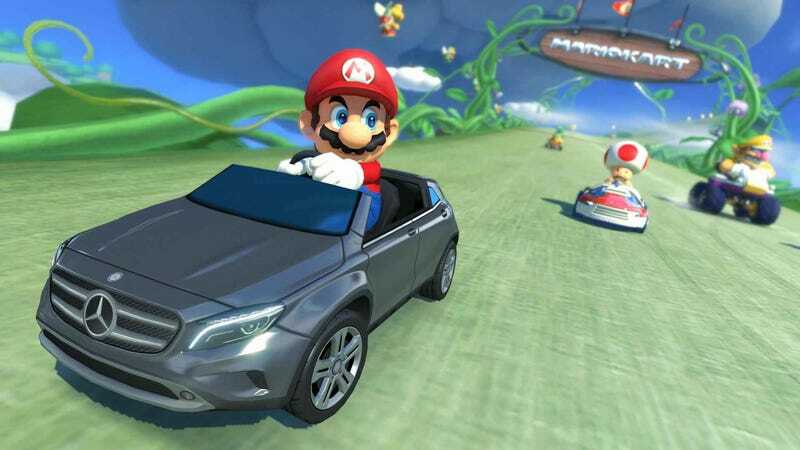 But I wonder if this Mario Kart/Mercedes tie-in will take vehicular product placement in games to a whole other level. We now have a real car, and a somewhat plain one, in the cartoony and ridiculous world of Mario Kart. Maybe you'll be able to steal Corvettes and Vipers instead of Banshees in the next Grand Theft Auto. Further, while I think this tie-in is a lot of fun and I'm all for more of real cars showing up in games like Mario Kart, I wonder how much it will really benefit automakers like Mercedes. Will Mario Kart 8 players go out and buy GLAs now? I suppose this kind of exposure can't hurt, especially if it's done in such a fun way. What real cars would you like to see in video games, and is there a way for car companies to make this kind of marketing work well?